Akabeko gasped, coming awake as if thrown into an icy lake. She sat up, weakly pushing the blankets away and swinging her feet down to the floor. She was breathing heavily, skin tingling with electricity under her unwashed fur. The tingling crept down to her hooves, filled her fingertips, enveloped her scalp and filled her with vitality. She pressed a hand over her racing heart, feeling light, practically giddy. In spirit, at any rate; her body had been greatly weakened by her long illness. Taking stock of her physical state and slowly catching her breath, Akabeko eventually became aware of Fu, who had been barking and leaping around her feet for some time. She reached down to pet him, but he could barely hold still for his excitement. "All right, all right," she said in mock-exasperation, surprised at how hoarse her voice was. Footsteps thundered up the steps, announcing the arrival of Weipon and Hadakha moments before they burst into the room. "Aka?" Wei asked hesitantly, eyes locked on the tauren. She stepped over what appeared to be sha residue staining the floor. 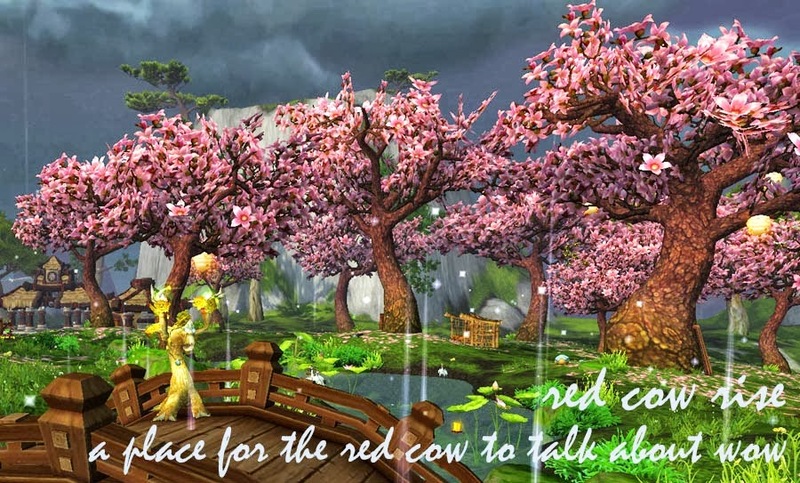 "Right here," Akabeko replied, glancing between the pandaren and the other tauren. "When did Had get here?" Before Weipon could answer, Hadakha stepped towards Akabeko. "Earlier today," he replied brusquely, peering at her with a healer's keen eye. Akabeko could feel the comforting warmth of his spells even as she saw the telltale glow appear around his hands. Weipon knelt beside her, staying far enough away to give her space. "How are you feeling?" "Hungry," Akabeko replied. "And sort of...forgetful. What happened?" "You were possessed by a sha," Weipon said quietly. "We pulled it out of you and defeated it just now, along with the sha that were in the rest of the villagers." Akabeko rubbed her forehead, feeling the gnawing hunger in her stomach sharpen. "In me and in the villagers? How long have we been here?" "I'll bring you something to eat," Hadakha announced, heading to the common room. Weipon inched closer. "We've been here for nearly a week, but you haven't been out of bed since the first day. I thought you were sick, but rest and medicine didn't seem to work. When we confirmed that the other pandaren were infected by the sha, we decided to use the same treatment you, and... Well, it worked. What can you remember?" Akabeko thought. "I mostly remember traveling here. I remember arriving at the inn, and feeling like I had no control of my thoughts. They wouldn't stop coming back to..." She stopped, interrupted by Hadakha's reappearance. He handed her a steaming bowl of stew and a fragrant hunk of fresh bread, and she wasted no time. Her hands shook with weakness while she ate as fast as possible. She knew that both Weipon and Hadakha were watching her intently, but couldn't bring herself to care. The need to eat was enough to keep her mind clear of memories of the previous week, which she knew she would eventually have to consider. When Akabeko had finished eating, Hadakha collected her dish in exchange for a cup of tea. "I need to bathe," she admitted guiltily, hoping that her stench wasn't too overwhelming. She made to stand, but found that simple motion to be too much, and had to lean against the wall until the spots in her vision cleared. "I'll change the bedding," Weipon offered, carefully not mentioning the druid's feebleness. "I will bring you more food," Hadakha added. Akabeko slowly made her way to the bathroom and washed, pausing periodically to rest her shaking arms. She relished the eternally-hot bathwater, letting it leech away the constant chill that the dreary clouds and rain had induced. When she emerged, less pungent but no more energetic, she found that her filthy pajamas had been spirited away, likely as part of Weipon's laundry endeavors. When she returned to the room, she found Weipon fluffing the pillow on her freshly-made bed, and a still-warm bowl of stew on the nightstand. Gratefully, wearily, Akabeko sat and ate again while Weipon politely tried to act as if she weren't watching the tauren extra-carefully. Hadakha was nowhere to be seen. Weipon took Akabeko's dish, tidying up the room while the druid settled herself into her pillows, too exhausted to be active for more than short bursts. "I know you said I've just been sleeping for the past week, but I'm afraid I might fall asleep again," Akabeko said apologetically. The monk set down the items she had been sorting, ignoring her cleaning in favor of talking to her friend. "At least now that the sha is gone, you'll start to get better." Akabeko nodded. "I do feel better already. Before, I couldn't stop thinking about sad things, things that I had lost..." She yawned. "I was stuck in this repeating nightmare, reliving it..." Her eyes slipped closed. "What things did you lose?" Weipon ventured, just barely audible as Akabeko sank into sleep. "My chieftain. My friend. And then... myself," Akabeko murmured. She slept. When Akabeko woke, she heard Weipon and Hadakha speaking Pandaren quietly nearby. She shifted, alerting them to her waking, and the voices stopped. She pushed herself into a sitting position, stomach grumbling. "Hungry?" Weipon asked, already standing. "Yes; thank you," Akabeko said sheepishly. When Weipon had gone, she looked at Hadakha. "How long was I out this time?" she asked in Taurahe. "Just under two hours," he replied. "We went to look in on the other villagers. The ones who recovered more quickly are caring for those who still need it. No one was quite as bad off as you," he added pointedly, looking at her. Akabeko raised an eyebrow. "I suppose that's what happens when you spend most of your adult life involved in some war or another." Weipon returned, handing Akabeko her meal, and the atmosphere became instantly businesslike. "As soon as Aka gets her strength back, we can press on to the Temple of the Red Crane," Weipon said eagerly, looking to Hadakha for confirmation. The tauren shook his head. "No, no. We can't go there." Akabeko frowned, looking between him and the monk. "Why not? Even if they can't come to us, we should still go to them. The Jade Serpent commanded it!" Weipon responded, sounding surprised. Akabeko was similarly confused. Why wouldn't the monks be able to come to them? Hadakha shook his head again. "There is no 'they.' The Temple is lost. There is nothing there for us." Before Akabeko could speak, Weipon jumped in. "If it is lost, then we must go help to reclaim it! The Jade Serpent would not direct us there if there were not a good reason to go!" "The Jade Serpent may not know," Hadakha replied evenly. "Did she know about this?" He raised his hands, gesturing around them. "She did tell us to come through this town," Weipon said resolutely. "She must have thought something was happening, even if she didn't know the specifics." "Then why would she send you to a place even further gone?" Hadakha countered. "I don't like it. The Temple is extremely dangerous, and we have no help - nothing like the Jade Serpent. There are no monks to aid us, and we don't even know where the Ancient is!" Weipon looked shocked, her voice even more agitated. "Don't know where the Ancient is? If that's the case, then we absolutely must go to the Temple to search for information! The celestials are such powerful beings... Something terrible must be at work for one to have completely disappeared." Hadakha only sighed. "Weipon, I have been there not two days ago. Do you trust me to know when a situation is hopeless? Because that is what I saw: a hopeless situation." "I do trust you, but..." Weipon shook her head in frustration. "What the Jade Serpent told us... why would she mislead us?" Hadakha leaned back, shrugging. "I can't say. We know very little of the politics, the people, the history of this land. Who knows what her reasons were? I spoke to her myself, and I don't believe she is evil, but... Beings that old, that powerful, can they really see us as more than game pieces?" "My people were once part of this land, and I have grown up with legends of the four ageless celestials. I know they cannot be evil," Weipon shot back, eager to defend the Jade Serpent. "But, if what you say is true... perhaps they are not as all-knowing as I once believed." "Well, regardless of whether they are all-knowing or not, what will happen if we try to reclaim the Temple directly is, to be blunt, our deaths and nothing more. There may be clues to be found there, but I believe it is too dangerous to attempt at this time." Pressing his argument, Hadakha finished with, "Especially with Akabeko in such weak condition." Akabeko wrestled back her annoyance at being called weak so directly and carefully set her empty bowl down. Weipon noticed this, glanced at the tauren's studiously neutral expression, and responded. "Setting aside the fact that if we do not continue to the Temple of the Red Crane, we will be directly disobeying an august celestial... If we don't go there, where will we go? Akabeko is in need of great healing, but I am hesitant to keep her here when this place was the cause of her trouble." "Exactly!" Hadakha leaned forward. "The Jade Serpent is the one who sent her here, and look at what happened! I know you did well against the sha here, but think about what it would be like to face many times that number. I don't think you understand the stakes here, Weipon." Hadakha continued, either unaware of or intentionally ignoring Akabeko's mounting annoyance. "I don't know where we should go, but we can decide that while we are waiting for Akabeko to recover." Weipon didn't understand the stakes? She had no idea what it was like to fight hordes of enemies? Akabeko's lips pressed together. Weipon stood and began to pace. "So we will wait here until Aka is recovered, and then what?" She shot a challenging look at Hadakha. "Will you wait with us? Will you be traveling with us now?" Hadakha sat back, frowning. "I... was planning to continue on to the Temple of the Red Crane." Understandably, Weipon exploded, sputtering out, "So you're telling me that it's too dangerous for us to go to the Temple, but that's precisely what you're going to do?!" She spat something in Pandaren, which Hadakha caught. He responded, sounding equally vehement, but abruptly stopped, appearing to catch himself. This infuriated Weipon, who began to sling short, bitter questions at him. Akabeko was also furious; her companions had been speaking as if she weren't even a part of the conversation, but now they were make it so she couldn't participate even by listening! "Orcish, please!" She shouted. "And a translation, if you will!" Ignoring her outburst, Hadakha continued speaking directly to Weipon, although his tone was more measured now. Weipon replied, still angry, and Akabeko caught her own name being bandied about. "What are you saying about me?!" she demanded. Weipon switched briefly to Orcish. "So you're going to go without us?" Akabeko sat up further. "What?" Not looking away from Weipon, Hadakha replied quietly in Pandaren. Not hearing, Weipon asked Hadakha increasingly desperate questions, to which he replied forcefully. Akabeko slammed her fist onto the nightstand, making the dishes jump and clatter loudly. "One of you had better tell me what is being discussed!" she roared, putting everything she had ever learned from training new recruits into her voice. They froze, argument dying immediately. Weipon was the first to reply, looking guilty. "Hadahka is going to the Temple of the Red Crane, while forbidding us from going there ourselves." "Well, forbid is not quite what I said-" he began, but Akabeko interrupted him. "Had, I do not take orders from you." Satisfied by his silence, if not his surly expression, she glanced at Weipon. "Frankly, I'm not sure that I take orders from celestial beings, no matter how august. But that is where the Jade Serpent directed us to go." She settled back painfully, tired from her exertion. "So you can go wherever you like, but know that once I am able to travel, I will decide where I go." "You can wipe that smirk off your face," Hadakha said coolly, glaring at both women. "This isn't over yet." He turned to Akabeko. "So you're determined to follow through with this?" Akabeko nodded. "Assuming we don't get some panicked Horde missive, I'm willing to investigate the sha presence at the Temple of the Red Crane as requested." Hadakha closed his eyes and massaged his forehead in frustration. "...Fine. All right, how about this, since you don't believe me. You'll need a few more days to recover your strength before you can travel, correct?" "And if I can convince Weipon to give up on this mad journey, will you agree to give it up too?" he pressed. Akabeko looked at Weipon, who appeared skeptical. "Assuming we can find a worthwhile substitute," she allowed. Weipon frowned. "Right." Hadakha stood decisively and pointed at Weipon. "Pack enough for a four-day journey. You wanted to go there? Well, now you are." He stomped out of the room. Akabeko exchanged a surprised glance with Weipon, which Weipon broke by rushing to her bag and beginning to repack it. "Well then," Weipon said lightly, bundling provisions into her pack while Fu scampered around her things. She scooted him out of the way to grab her waterskin. "I'll tell the innkeeper to look in on you, and see if a healer in the village can come to see you as well." Preparations made, she stood, wanting to hurry Hadakha before he had time to change his mind. "I trust you, and I trust Had, but be careful out there," Akabeko said seriously. Weipon nodded. "Of course. We'll be back before you know it, and then we can go there together!" Akabeko watched the pandaren rush eagerly out the door, hoping that the unpleasant sensation in her gut was merely hunger and not foreboding. Well... hopefully Hadakha and Weipon will run into Anduin along the way. He might make "a worthwhile substitute", hmm? Miss you lots, hope work & RL are treating you well!